Range: Found from the western third of Kansas southeastward through southern Flint Hills to the Ozark Plateau in southeast corner of state; with the exception of an isolated record for southern Miami County, absent from entire northeastern quarter of Kansas. Description: Harmless. 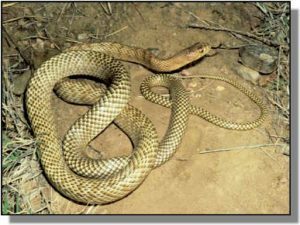 Smooth scales; yellowish brown color on the rear part of the slender body; body scales have braided appearance. 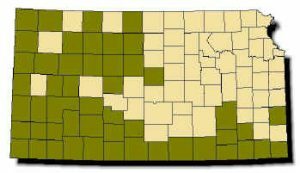 Two distinct color variants: may be uniform light yellowish brown along entire length of body (western Kansas) or jet black on the front half, gradually becoming yellowish brown on the rear or completely black (southeastern Kansas). Belly whitish with indistinct small spots (west) or black on the front half and light on the rear (southeast). Young are yellowish brown with dark brown crossbands on front of body that fade and disappear on rear. Belly white, with two rows of dark spots on front half. Habits: Found in widely varying habitat, from open grassland prairies in western Kansas to rocky hillsides in open woodlands in southeastern part of state. Active from April to October; completely diurnal, even during the hottest hours of day. Lays 4-11 eggs in summer which hatch in fall. Feeds on bats, mice, birds, lizards and smaller snakes.